Recommendations tend to require the most troubleshooting. Applicants can misspell a recommender's email address or forget to hit 'Send' after entering the recommender's contact information. Alternatively, recommendation requests can sometimes go to the spam folder, or if the applicant hasn't notified the recommender that they are sending the request, the recommender may delete the email. 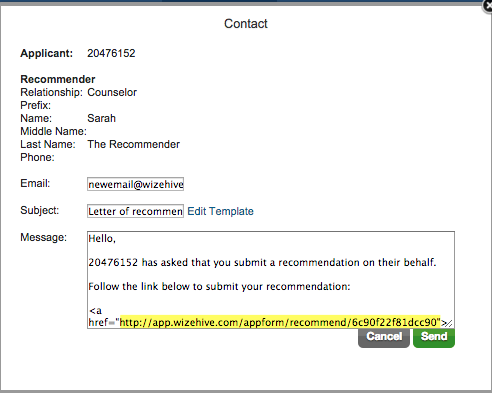 If you have an applicant contacting you about the status of a recommendation, you have the ability to see the status in the backend, as well as preview the information that the application entered and even retrieve the unique recommendation form URL to send to the recommender directly. To accomplish these tasks, first open the Recommendations tab of your workspace. The first screen you should see when entering Recommendations is a grid of all recommendation requests. You should see a column indicating the Entry Name and Applicant Email, and then three columns relating to the recommendation's status. Responded: The applicant successfully sent the recommendation request, and the recommender successfully submitted the recommendation. Contacted: The applicant successfully sent the recommendation request, but the recommender did not yet submit the recommendation. 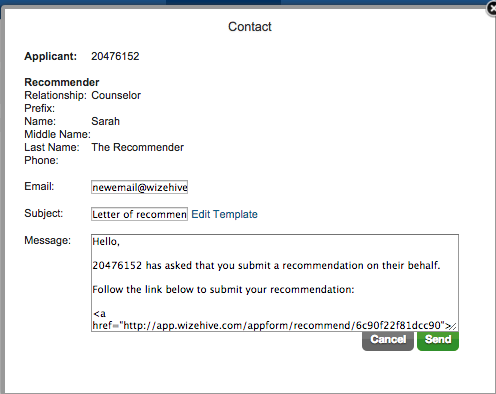 Not Contacted: The applicant entered the recommender's data and saved it, but did not yet send the request. 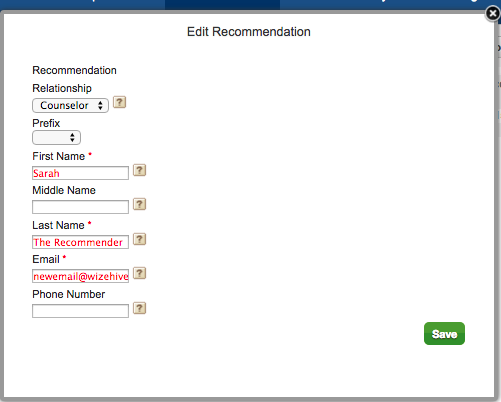 If an applicant has not yet entered any recommender's information, then that request will not show up in this grid. This grid only captures information regarding applicants who have at least entered contact data for the recommender. If you have an applicant inquiring about a recommendation status, you can search for that applicant via the folder panel, to look at his/her recommendation statuses specifically. If the recommendation's status is Contacted, then the applicant did successfully send the recommendation, but there could be mistakes in how they entered the recommender data. Another way to troubleshoot on the applicant's behalf is to see what contact information was entered in the recommendation contact form and to verify that the email was entered correctly. To do this, click 'actions' next to the recommendation in question. Select 'edit' from the dropdown. The next screen will show you what the applicant entered for this recommender. If the email address is incorrect and you know the correct one, you can enter this yourself here and click Save. If you do this, however, you will need to resend the request. You can do this on the applicant's behalf by clicking 'actions' again and selecting 1st email. Clicking 'Send' here will resend the email to the Recommender. If you'd prefer to send the URL directly instead of resending the email from WizeHive, you can find the URL in the above 1st email box we just opened. Copy this URL and paste it into an email. Alternatively, you could open this URL up in your own browser and complete the recommendation form on the recommender's behalf, where applicable.